This is Ira’s playbill and his story… but it’s my entry so I’ll tell it. 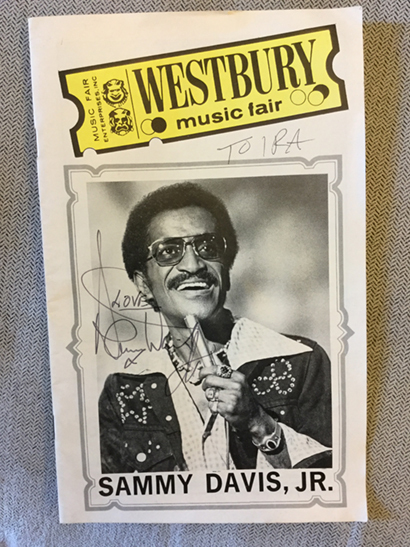 He and his brother Neil went to see Sammy Davis Jr. live in the 70s, at a theater in the round, meaning performers had to come down an aisle through the audience to get on stage. When Neil realized they were sitting near Sammy’s aisle he pounced, climbing over a bunch of old ladies in order to shake Sammy’s hand like a true fanatic. After the show they each got autographs by sending their programs backstage. Someone else (Neil perhaps) wrote “To Ira” on the top, but the rest is authentic. 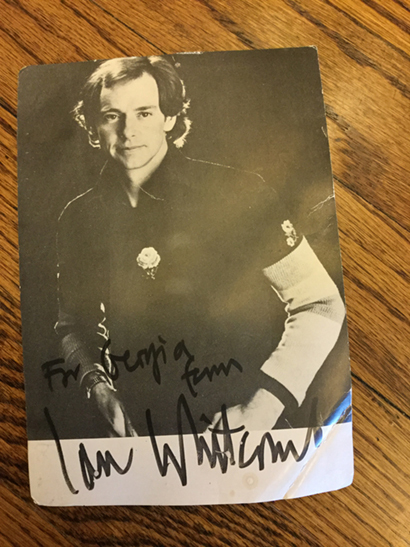 When I was about 20 years old I was taken with Ian Whitcomb for some reason. He had a couple of hits in the mid 60s with the catchy novelties “You Turn Me On” and “N-E-R-V-O-U-S!” He also produced Mae West’s pretty nutty pop album. Okay, that record’s kind of great, so maybe that’s why I wrote him a fan letter. He sent me some of his books about ragtime along with this card. The only reason I own this (and apparently kept it for 30-plus years) is because it came inside the album by the band Monitor that I bought at a show of theirs in LA in 1981 or 82. Not original. The autograph, I mean. The band Monitor on the other hand, very original. 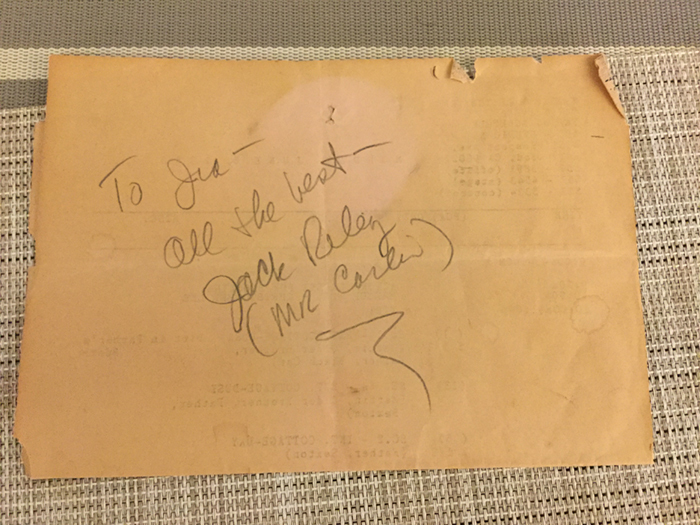 A friend found himself in Jack Riley’s presence and requested his autograph which he scrawled on the back of a call sheet. Jack Riley played Mr. Carlin on The Bob Newhart show for those who aren’t MeTV devotees. 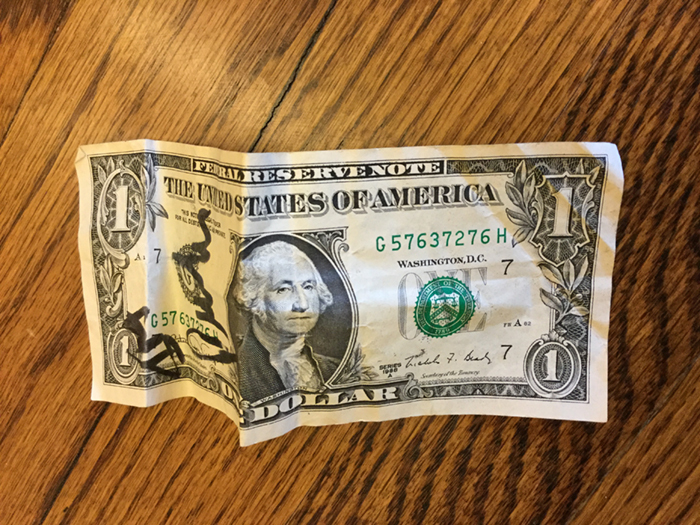 As you can see Mr. Carlin felt compelled to identify himself and make sure the recipient (Ira) knew why he was given this autograph. A gift from Ira’s brother Adam. I have no need for more autographs now that I have these. 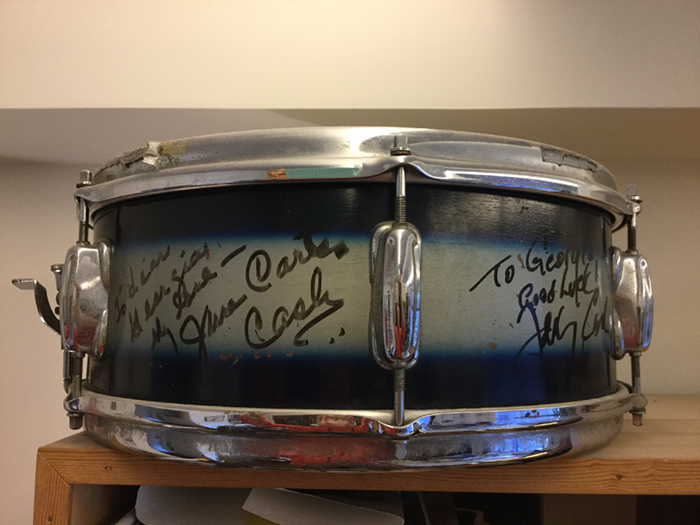 I asked both June and Johnny to sign my (now retired) snare drum when our band was lucky enough to open for them in 1994. The two of them each voiced their concern over blemishing the drum. 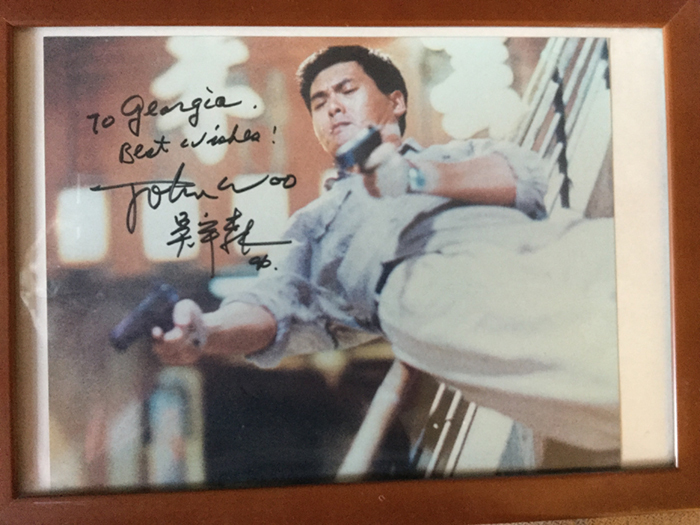 Chow Yun-Fat in The Killer, signed by JOHN WOO. A gift from another John Woo fan. Ira and I had a connection to Maxwell’s in Hoboken where Bruce Springsteen’s video for “Glory Days” was shot. But it was Jim Turner, on the production crew, who arranged for us to be extras. My friend Tara taped the video on her vcr and was able to freeze the half-second I appear on screen to take this picture—that’s me behind Steve the cook (possibly the original Maxwell burger king) not throwing my fist in the air as directed. 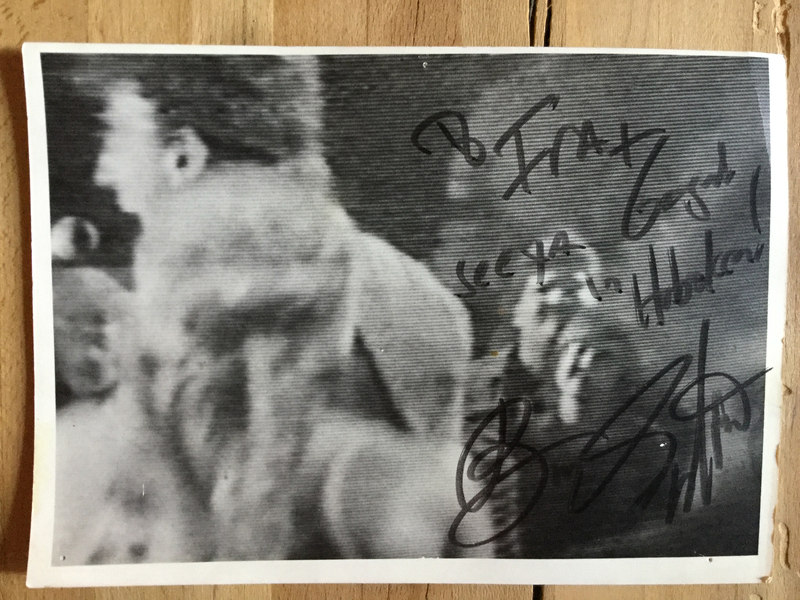 Many years later we persuaded a reluctant Roger Moutenot, our record producer and Springsteen/Scialfa insider, to get it autographed by Bruce at the Meadowlands concert he had backstage passes to. As an unassuming and soft-spoken type of guy Roger really did not want to do it, but we put the squeeze on him. Since he had to cut out of our mixing session in Times Square early, seemed only fair to make him squirm briefly. 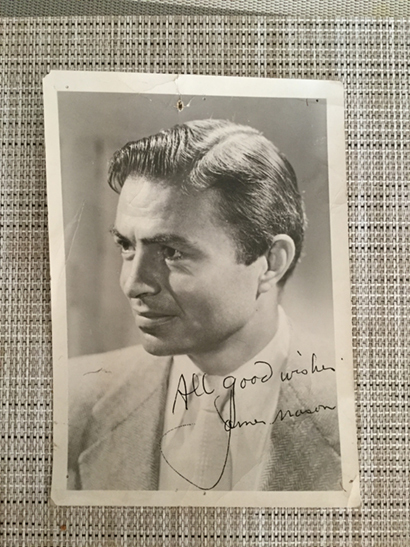 Despite not needing more autographs I am very happy to have this one. Come to think of it, I’d be thrilled to get our 5 Neat Guys 8×10 signed someday. We bought a couple of Robert Quine’s guitars from Carmine Street Guitars after he died. 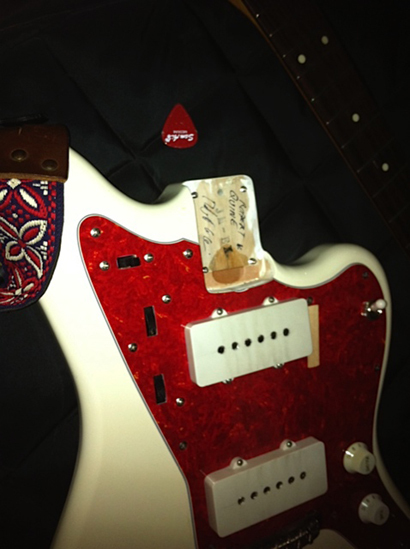 A few years later our pal Gil had reason to disconnect the neck from the body which revealed his signature. Somewhere we have a still from Billy Liar that a film editor friend asked her to sign for us, and I believe she spelled YO LA TENGO correctly. This may be the first autograph I got. I remember being terrified approaching him at Forest Hills when I was 11. My brother Ray put me up to it. As a knowledgeable sports fan he knew something of tennis stars and their reputations. This one’s probably nice, this other one has a temper…that sort of thing. Our label-mate Liz Phair was performing on David Letterman in the 90s and Albert Brooks was also on the show that night. We asked Spencer, the Matador publicist at the time, to get him to sign Ira’s three copies of his two albums. He signed the shrink wrap on one, the protective plastic on another and actually managed to make direct contact with the third record cover. Georgia Hubley was born in 1960, in New York. She is an American percussionist, vocalist, and visual artist. She is one of the two founding members of Yo La Tengo.